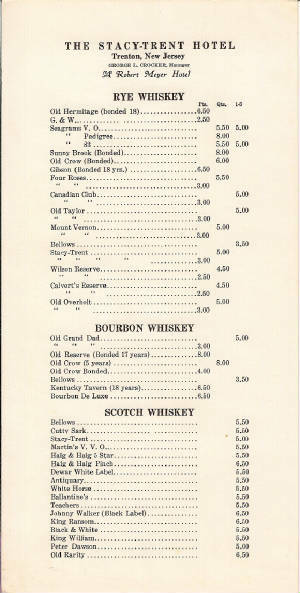 This page lists a whiskey list from the Stacy-Trent. Although the list is undated, its approximate age can be determined by its reference to the Stacy-Trent as a Robert Meyer Hotel, which was between 1934-1946. "Pts." refers to a "pint," which is 16 fluid ounces; "Qts." refers to a "quart," which is 32 fluid ounces; and "1-5" refers to a "fifth" of a gallon, which is 25.6 fluid ounces.